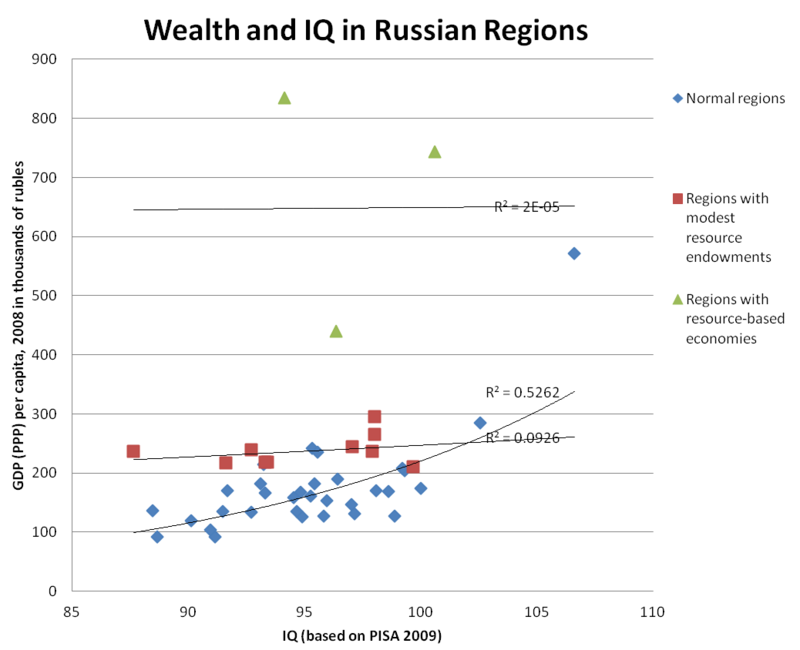 A few months ago I posted a table and map of Russian IQ’s as derived from regional PISA performance. Those figures are based on Jarkko Hautamäki’s slideshow comparing regional PISA performance in Finland and Russia. That material is a bit inadequate because, as had been my custom up that point, I was only making IQ estimates based on the Math and Science components of the PISA tests, and avoiding Reading to maintain reverse compatibility with my (now disused, in favor of just IQ) Human Capital Index. In light of some realizations that verbal IQ is no less important than numerical, I have updated the figures to include the verbal component as well. 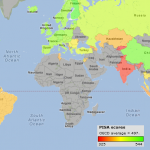 This doesn’t create any radical changes – the overall IQ only drops by 0.3 points – so I reuse the same map. (1) In some regions, margins of error are high, as samples were low. Nonetheless, it is still possible to identify some concrete patterns. The overall estimate is very accurate because the sample was N=5,308 and representatively distributed across the country. (2) Moscow pupils performed very well, at the level of the highest scoring OECD countries like Finland, Taiwan, and Korea. This is especially impressive considering the significant numbers of immigrants in that city from the North Caucasus and Central Asia, who come from poorly-scoring countries and rarely have good Russian. This is surely the result of a century of attracting Russia’s (the USSR’s) cognitive elite. (5) Performance in ethnic minority republics differs dramatically. Many of the Turkic and Finno-Ugric regions, such as Tatarstan, Komi, Chuvashia, and Karelia did well; however, Mari El is a big exception. The Buddhist peoples of Asia, such as Chita oblast (now merged into Zabaykalsky Krai) and the Sakha Republic, performed relatively poorly, as did the Muslim North Caucasus region of Dagestan. Chechnya and Ingushetia would probably score around very low – probably in the mid-80’s. We can be pretty confident about that because their unemployment rates are nearly 50% despite tons of federal transfers. 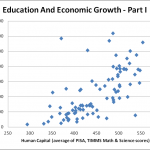 Doing the same exercise as I once did with Italy, the exponential correlation between IQ and GDP per capita (adjusted to reflect local prices; 2008) turns out to be R2=0.5262, if we only take into account those regions whose economies aren’t skewed by substantial natural resource sectors. This is not as good as Italy’s R2=0.7302, but the result is still an amazingly good one in social sciences. In fact in Russia’s case it’s all the more impressive because its economy was for the most part built up under central planning, which isn’t as good as markets at allocating resources efficiently. Even under a command economy, the principle still holds: Higher average IQ, higher human capital, greater productivity, greater GDP pre capita. (1) The PISA-derived IQ is 96.0. (2) Richard Lynn estimates Russia’s average IQ to be 96.6 in his 2012 book Intelligence: A Unifying Construct for the Social Sciences. (3) Heiner Rinderman estimates it at 97.3 in a 2009 paper. The two most comprehensive authorities on international IQ’s, as well as the most comprehensive international standardized test, are all in agreement that Russia’s current average IQ is in the 96-98 range. 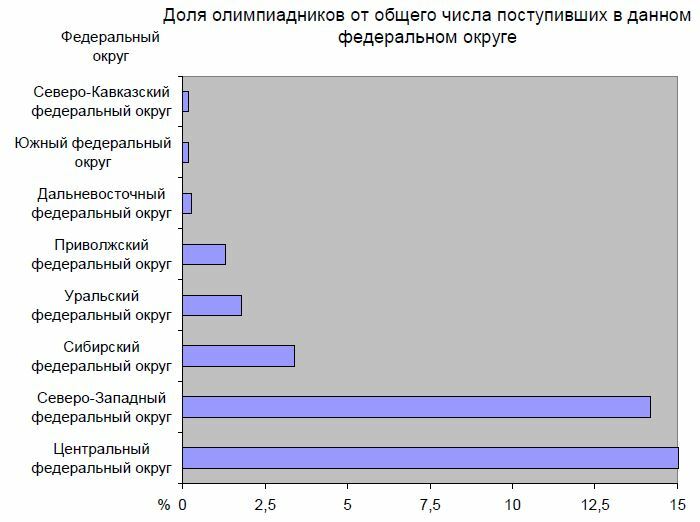 (1) Map of average Unified State Exam (USE) scores among Russians admitted to institutions of higher education in 2010. This is a biased sample because it only measures those Russians who were admitted to a university in 2010. It is not indicative of average regional IQ. Data from Межвузовское исследование «Успеваемость студентов первого курсавысших учебных заведений России». (2) Here is the same data by Federal District. They are, in order: Volga; North-West; Siberia; Central; Urals; Far East; North Caucasus. 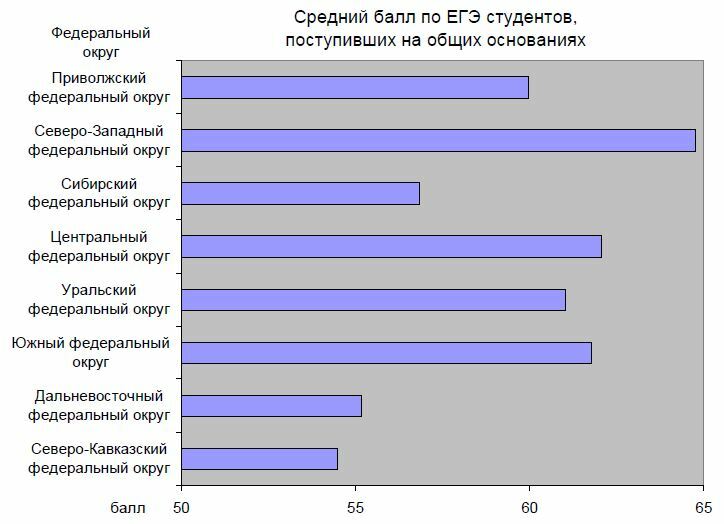 (3) The share of “Olympians” (basically students who did really well and get benefits) in the annual university cohort. 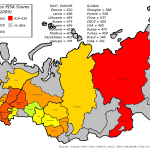 By region from top to bottom: Northern Caucasus; South; Far East; Volga; Urals; Siberia; North-West; Central. There is nothing surprising about this. 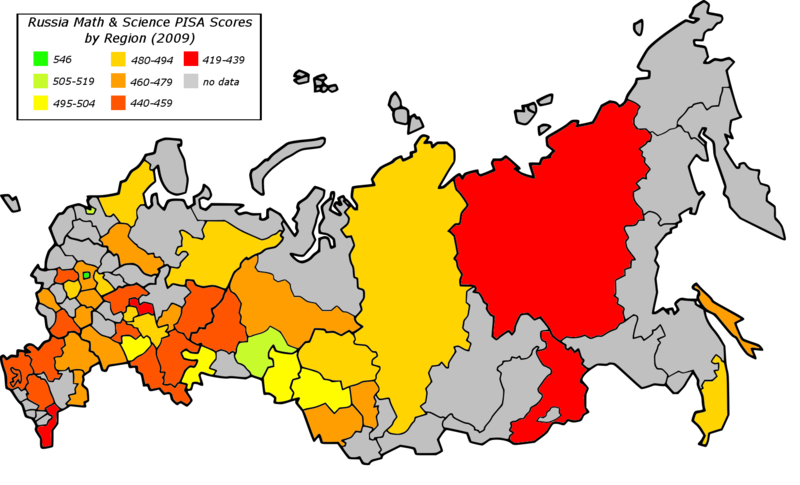 The Central Federal District contains Moscow. The North-West Federal District contains Saint-Petersburg, and I also suspect that ethnic Russians from the North-West region also have the highest IQ potential of all Great Russians because of admixture with Finno-Ugrics. (Finns and ethnic Estonians both have very high PISA scores). (4) Unfortunately, Russia does not release regional average USE scores. It does this on purpose to avoid inciting ethnic enmity. (Basically, some regions – most of them non-Russian ones – systematically cheat and inflate their USE scores). The Ukraine didn’t participate in PISA 2009, but extrapolating from its TIMSS scores, its IQ would be around 93.1. Belarus would probably be considerably higher, because (1) they are basically genetically identical to Great Russians and Poles, and (2) they have done economically better than Ukraine since the 1990’s despite keeping much of their economy state-owned. This section will be updated with info on other countries in the near future. The Slavic genetic ceiling appears to be around 100 based on the Czechs and Poles. The average height of young Russian men is about 175cm compared to 179cm-180cm among the Central-Europeans (Poles, Czechs, Slovaks). This discrepancy likely arose from the fact that Russia’s (and Ukraine’s) post-Communist transitions were far more catastrophic than those of the Poles and Czechs, involving a major deterioration in quality of nutrition during the 1990’s when the PISA 2009 cohort was growing up. Russia’s meat consumption per capita (kg). Russian nutrition has already returned to First World levels however; for instance, meat , fish, fruit, etc. consumption is now basically the same as in Europe or the US. This means that in the next decade I expect the Flynn Effect to kick off in Russia’s favor, raising its average IQ levels to their theoretical peak of 100 by the 2020’s.